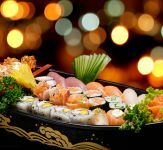 Sushi Recipes | All the different kinds of recipes that you've been looking for! Looking for your favorite Sushi Recipes? or maybe even try your "hand" at making the beautiful and challenging (hand-formed) Nigiri - always a favorite way to impress your guests! You've come to the right place. We will do everything we can to have the right recipes for you, where ever you are at in your culinary journey. Everybody knows how important a good foundations is... Without it, a house will fall. The same is also true here. But here, it is critically important. You must follow the very best recipe that you can find. You mess up on this, and even if your rolls look perfect, they will not pass the taste test. 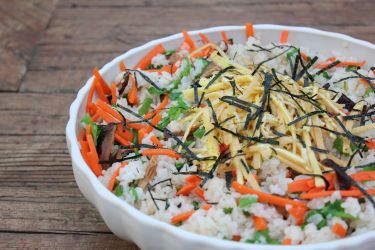 This Sushi Rice Recipe is based on the one that my now 80 year old Japanese mother used when she made it for me when I was growing up. This will give you the solid foundation that you need to make excellent sushi for you, your friends and your family! So you want to learn how to make sushi rolls? Who could blame you? Maki rolls are probably one of the most popular types of sushi recipes that people want to try to make at home. And the most popular roll out of them all, at least in the U.S., is the California roll. 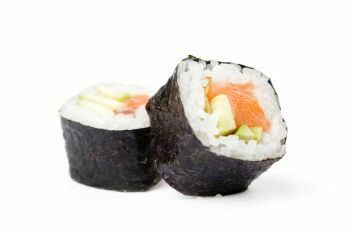 There's an interesting history to the California roll too, but you can read about that on our California Roll Recipe page. There are so many sizes and types to these rolls, that it might be best to try to organize them in a way that you can get your mind around first. And then start associating them to sushi recipes. I think that the best way to actually do that might be to start by referencing the generic Japanese name of the roll and associate that to a size (diameter) and a number of ingredients. That way, you will see that almost any roll that you want to duplicate at home will fall under one of the following "generic" categories and you will just need to determine the size of the roll, the type and number of ingredients that are in it, and then associate it to the proper roll. Whalla! You can now make it at home! The reason I encourage you to learn to think of these rolls in this way is because there are soooo many specialty rolls out there and many more being created everyday that it would be impossible to have them all on a single website. I want to empower you to be able to duplicate almost any roll you come across in your adventures, on your own! Here's the first 3 rolls that we are going to go over. I've put these 3 together because they are all traditional rolls made with the Nori on the outside and rice on the inside and are different mainly based on their size (diameter) and the number of ingredients. 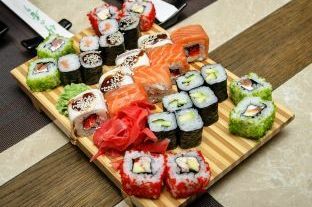 Starting from the left we have Hosomaki, Chumaki, and Futomaki. 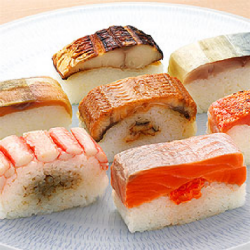 The Hosomaki roll is the thinnest roll in our lineup at about 1 inch in diameter. It normally is made with one ingredient and rolled with the Nori on the outside and rice on the inside. Pickled daikon radish Takuan ("Takuan Maki"). There are others, and you can use any ingredient that you especially like, but those are some of the most popular. If you are wanting to learn how to make a maki roll, this is a good one to start with. You can learn to how to make a hosomaki roll (the ones stated above actually) by visiting our Hosomaki page. 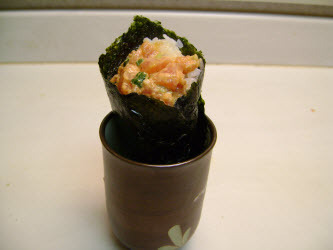 The Chumaki roll is as the title states above, a medium sized roll. It usually measures about 1 1/2" in diameter and out of all 3 rolls it is probably the easiest to make. The size is "just right" and most forgiving for most beginning rollers. 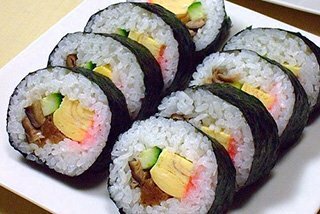 It normally is made with two to three ingredients and is rolled with the Nori on the outside and rice on the inside. This roll is made differently from the Hosomaki roll in that it uses a full sheet of Nori and twice the amount of rice along with more ingredients. 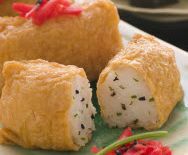 To learn how to make a Chumaki Roll, visit our Chumaki page where you can get all of the details. I have to admit it. Futomaki is one of my favorite sushi recipes. I think it all goes back to when I was little and my mother use to make it. Not as often as say, Inarizushi (rice in a fried tofu pouch) or onigiri (rice balls), because futomaki is a lot more time consuming. But definitely worth it! With an overall diameter of 2 to 2 1/2 inches and stuffed with up to 4 or 5 ingredients (normally all vegetables and omelet and no meat), all I can say is - wow. It can be a mouthful. But ohhh, so good! I encourage you to make this roll. You won't be disappointed! If you've decided to take the plunge, you can learn how to make a futomaki roll on our Futomaki page. 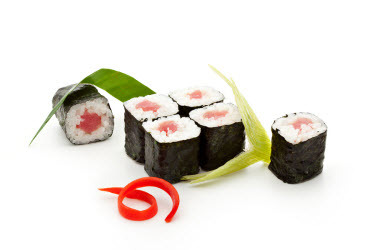 Whereas the Hosomaki, Chumaki and Futomaki are rolled with nori on the outside and rice on the inside, Uramaki is rolled with rice on the outside and nori on the inside. And believe it or not, it was created this way for a very good practical business reason. It seems there was a sushi chef in Los Angeles in the late 1960's that had customers complaining about the texture of the seaweed surrounding his maki rolls. So he decided to roll it with the nori on the inside instead of the outside effectively "hiding" it from his patrons. His customers were satisfied, and the California Roll was born. Today this technique is used to make many other creations, not just the California roll. But the California roll is still, without a doubt, the most popular. 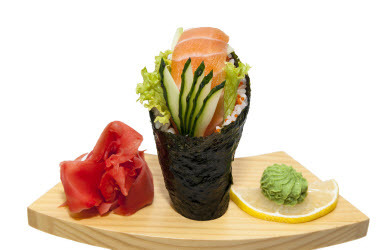 To learn how to make a uramaki roll, visit our uramaki page. The Temaki roll is the perfect choice for a do it yourself party. If you are looking to inject more fun and merriment into your next at home event, then this is guaranteed to make for at least an interesting evening. 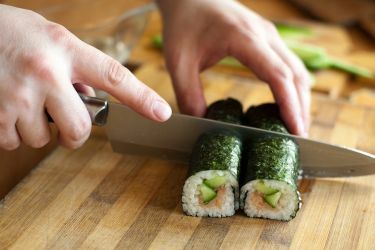 The Temaki roll is essentially "assembled" in your hand; with one hand holding the nori and rice while the other is placing the desired ingredients on top of the rice. When you are satisfied with your choices, just roll it up like a cone and enjoy! 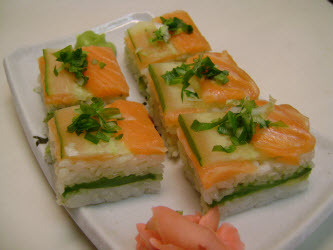 If you are ready to learn how to make a temaki roll, visit our temaki page. 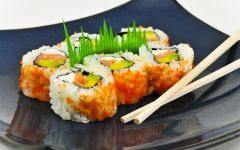 These sushi recipes show you how to make the "generic" version of the Japanese maki rolls based on the diameter of the roll and the number of ingredients, if they are rolled with rice on the outside, or if they are a cone shaped roll. 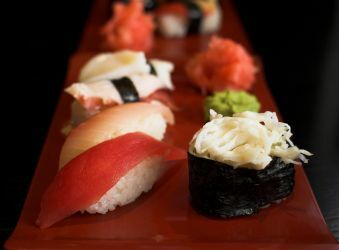 You could use these sushi recipes to duplicate a roll that you may have tried at a sushi bar without having to have the recipe. Just note the diameter of the roll, the type and number of ingredients and any condiments that were used. I'm not exactly sure if nigiri is more difficult to make than a maki roll or not. Some maki rolls (like the futomaki) can require quite a lot of preparation before you can actually assemble and enjoy it. And when it comes to assembling it, it can be difficult to roll because it can be so darn big. Part of the difficulty for some I think is because normally nigiri is hand-formed. 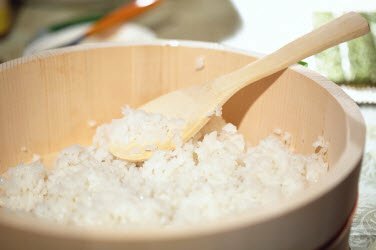 Meaning that the little pads of rice that you see experienced chef's crank out in a matter of seconds at your favorite Japanese restaurant are all made by hand. They can make it look a lot easier than it actually is for a complete novice. But remember. A real Japanese chef could have up to 10 years of training before he can become the Itamae or head chef. So don't feel too bad when your first attempts are lop sided, fall apart or are all different sizes. Its Ok. That's part of the fun, right? But there is hope. 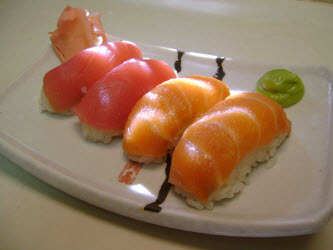 Instead of trying to do it by hand, you can try to use a nigiri mold. If you find yourself getting frustrated trying to make them by hand, then give a nigiri mold a try. They are pretty cheap, and it would be better than throwing in the towel and giving up. If you are ready to ride this bull, then follow me on over to our how to make nigiri page. Get all of the taste and flavor without all of the rolling and molding and forming rice with your hands! A Chirashi sushi recipe is probably one of the easiest ways for you to enjoy sushi at home. It is also a very popular way to prepare it at home in Japan too. As you can see from the pictures above, all of your desired ingredients are mixed with rice in a bowl or container and dinner is served! For those who want a shortcut to making a sushi recipe at home, this is it. And although Chirashi with vegetables and omelete (with no meat included) is actually the most popular variation enjoyed in Japan, other versions do include slices of various meats and seafoods also; so you can get your meat laden fix this way too. Convinced? 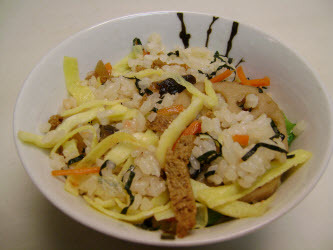 Check out our chirashi page if you want to learn more or try my mothers recipe. If you thought that it couldn't get any easier than with the Chirashi Sushi Recipe, Well... I think it just did! A Chirashi sushi recipe may be fairly easy to make for the novice, but Inari just might have it beat. 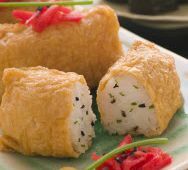 Inari is made with rice that is stuffed in a double-fried bean curd bag that has been cooked in a salty, sweet marinade. 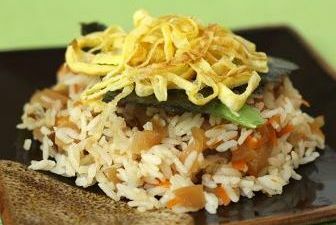 And although you can buy the abura age bag already seasoned (called inarizushi-no-moto) and ready to stuff, my mother always "re-seasons" the bag to her liking with her own simmering sauce. Learn how to make this favorite Japanese bento box stuffer using my 80 year old mother's Inari recipe, or learn more in general about Inari on our Inari page. If you want to impress your family, friends or guests the next time you prepare a sushi recipe, then give this oshizushi recipe a try. Even experienced connoisseurs many times have not tried this variation of a sushi recipe (at least in the U.S.), but it is very popular in Japan. Visit our Oshi page, or if you are ready to give it a try, then visit our Oshi Recipe page. Delicious with sashimi, shabu shabu or as a dressing. Easy to make! Have A Great Sushi Recipe that you want to Share? or Are you Looking for a Specific Recipe that you can't Find? Just Ask for It! How about asking for it! Then if I or anybody in our audience has it, we can pass it on to you right here.